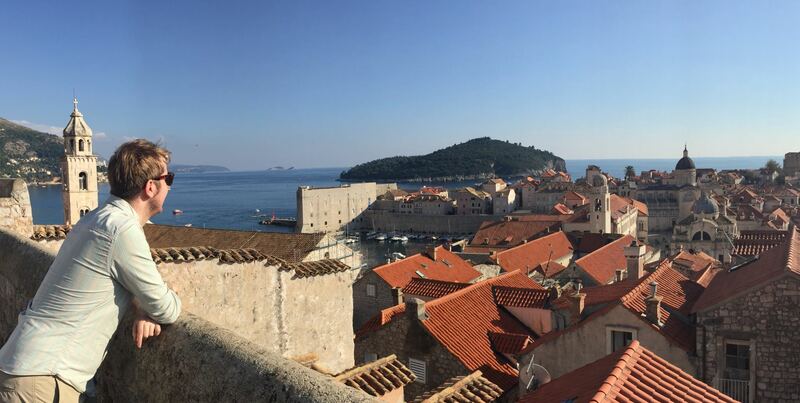 Terracotta roofs, boat trips over blue seas, warm sunshine and friendly people make Dubrovnik an ideal getaway, even if you don’t watch Game of Thrones. Obviously the first thing to do is get yourself to the Old Town. Walk around the paved streets, take a look at the harbour, discover hidden churches and walk in and out of shops. The shops are slightly odd but definitely entertaining. 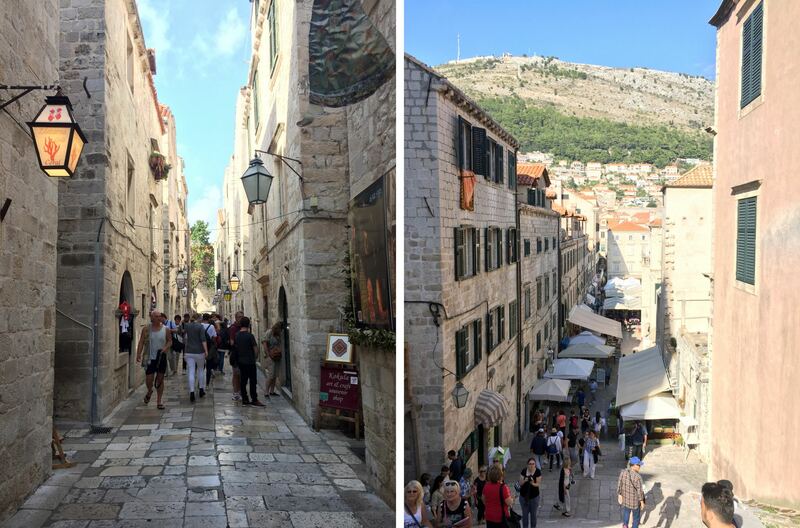 The common appearances are Dubrovnik souvenirs, pirate-themed sweets, striped t-shirts and baby clothes, and merch from Game of Thrones (which appears alongside Star Wars, Harry Potter and for some reason, steampunk hats?). DO NOT repeat DO NOT pay for a Game of Thrones tour. You will be overcharged for information you can find yourself on the internet – do your own self-guided tour instead! Exploring Old Town for the first time is the prime opportunity for walking the walls. It might seem a little daunting in the heat, but trust me it is well worth it. There’s a new view around every corner! Every turn brings a whole new view with it, to the point that you won’t know where to look – over the terracotta roofs of the Old Town? Down into the hidden gardens and patios? Out to sea with its boats and islands? At Mount Srđ looming in the distance? There is a real risk of overstimulation here. Pace yourself. One adult ticket costs 150kn, or you can do a package deal and pay 190kn for a day ticket to the walls, the monastery and the fort. This was my favourite day of the trip. Lokrum island is a 15 minute ferry ride from the Old Port, and whilst the boat is packed, the island is pleasantly quiet. It’s main attraction is the Benedictine Monastery Of St Mary (Benediktinski samostan), which is possibly all the more beautiful for being in ruins. Surrounded by trees and populated by rabbits and peacocks, the monastery also plays host to the delightful Garden of Eden restaurant, and to a Game of Thrones exhibition complete with Iron Throne. 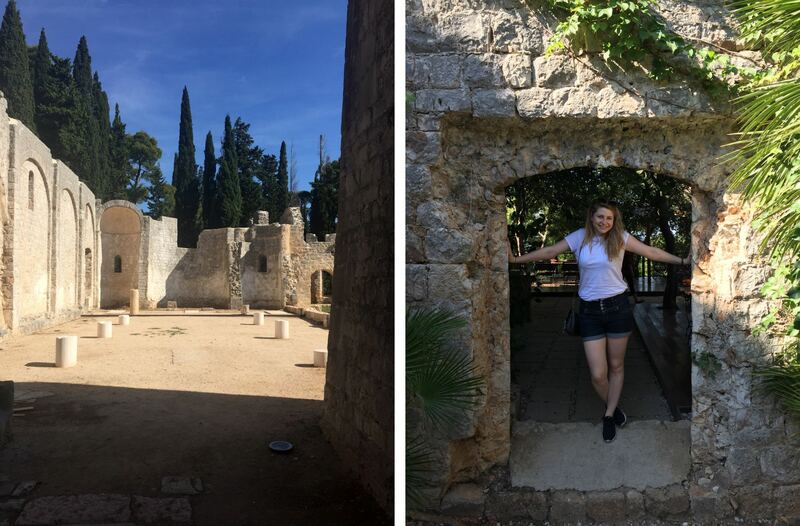 Also available for exploring are the rock pools around the south end of the island, the cactus gardens next to the monastery, and the ruins of Fort Royal (Utvrda Royal) at the highest point, which you can climb to look back towards Dubrovnik. As you wait for the ferry back you can paddle by the rocks, watch the other boats or get a drink from Lacroma, the cafe bar by the docks. The ferry costs 40kn per ticket, which you can buy at the port itself either in advance or on the day. 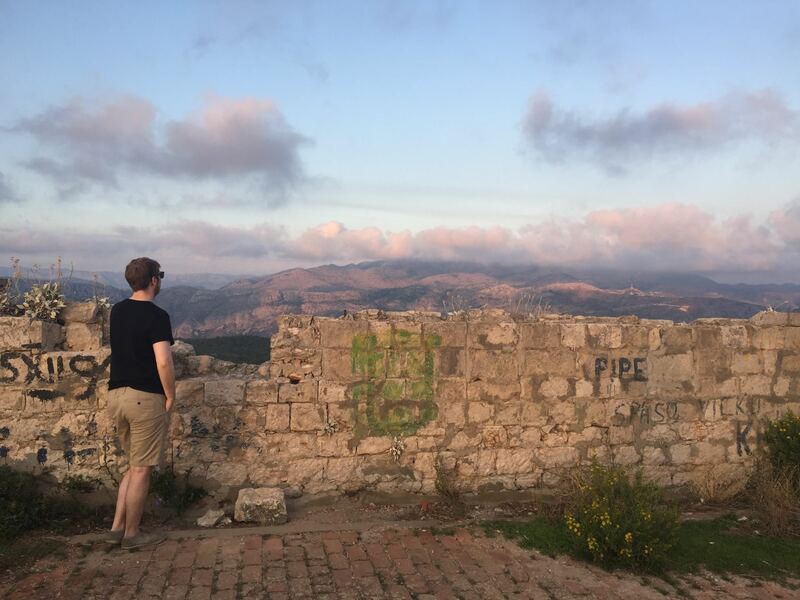 OK, so you can hike up Mount Srđ, that is absolutely an option, and apparently it’s amazing and blablabla, but I’d like to make a case for the cable car. It’s faster, you get to look out the windows at the amazing view the whole time, and when you get to the top you’re not completely exhausted. We did this trip in the afternoon after our excursion to Lokrum, and we timed it perfectly so we saw the sun set over the sea. The view from the top of Mount Srđ. We also went in the Museum of Croatian War of Independence, housed in the Napoleonic Imperial Fort on top of the mountain. The fort itself is still scarred with bullet holes, as this was a site of resistance against the Serbs. This conflict was so recent in the history of the country that there is video footage of bombs hitting the hotels, flats and the Old Town itself. The museum almost feels like compulsory viewing to better understand Dubrovnik. One return ticket for the cable car costs 140kn, and entry to the museum costs 30kn. If you need to get out of the sun for a while, or you’re just having too much fun and need to bring yourself down for a bit, War Photo Limited is a gallery of war photography, mainly from the Balkans war in the 90’s but also from conflicts around the world. It’s very sobering, and goes a little further in making you more aware of the country’s recent history. Tickets cost 50kn each, and a stroll round the exhibit takes around an hour. 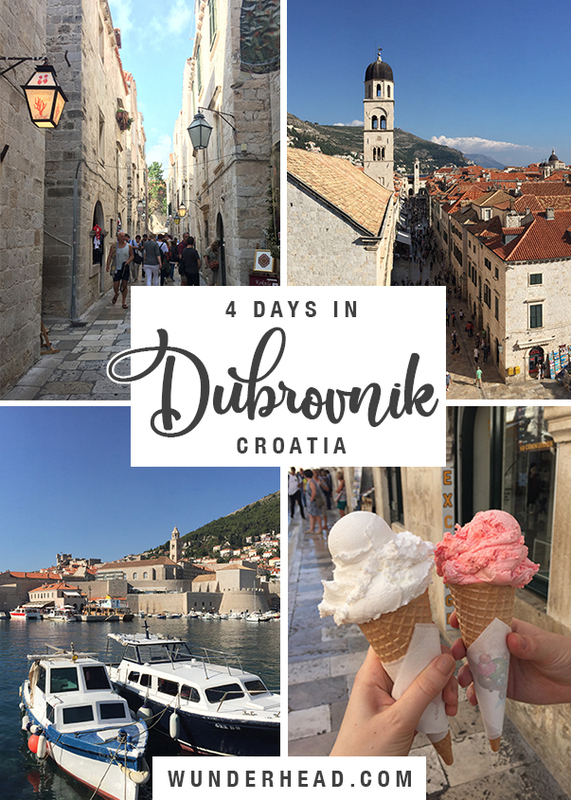 On our last day in Dubrovnik we went on a day trip to Cavtat, a little nearby town full of restaurants and narrow little streets to explore. 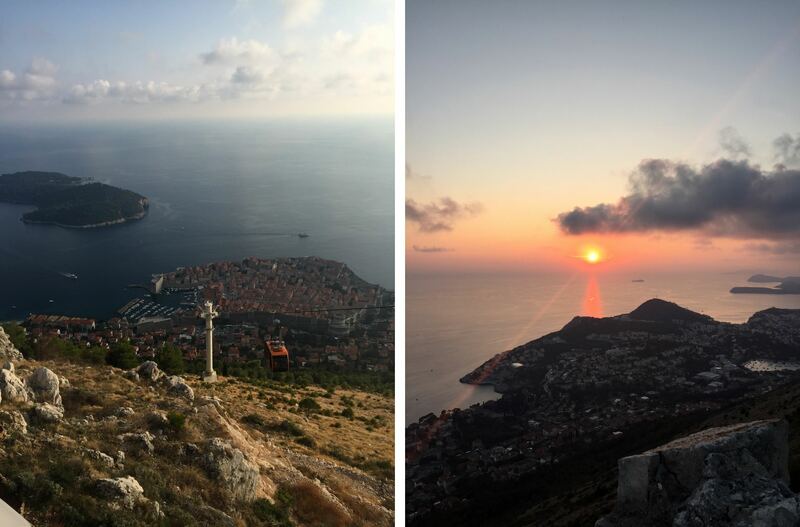 At its highest point sits the Mausoleum of the Racic family (Meštrovićev mauzolej obitelji Račić), which includes a cemetery with an amazing view over the sea (can you really have enough of those?). 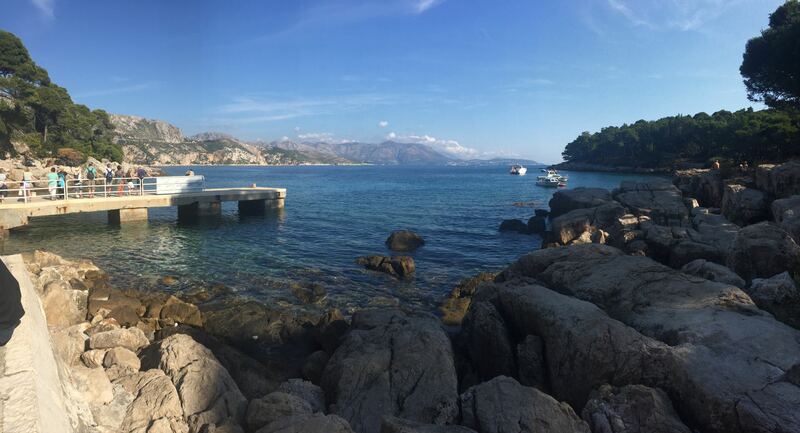 You can also walk around the headland, and explore the little harbour before catching the ferry or bus back to Dubrovnik. As a seaside town you can expect seafood on every menu. The Dubrovnik speciality is crni rižot or black rice, which is cuttlefish risotto with black squid ink, a very rich dish with a slight mushroom flavour. Full disclosure, I don’t eat seafood and I hate mushrooms, so crni rižot was a bit much for me, but Matt really enjoyed it! If you’re more of a meat person make sure you try ćevapi, small sausages that are often the chef’s speciality, served with chips. 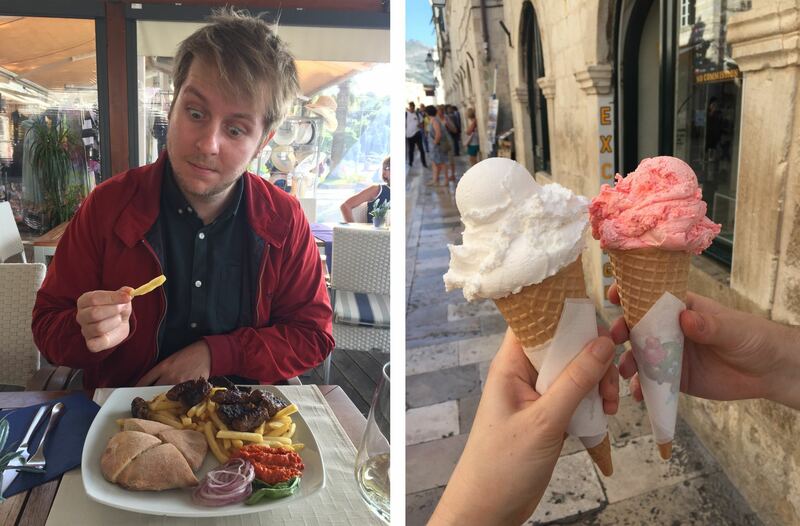 Dubrovnik is also littered with Gelaterias, which we took advantage of on multiple occasions! Left: Matt enjoying cevapi & chips. Right: Gelato on the main street. The best meal of the trip was easily at Taj Mahal in Old Town. Recommended to us by my parents who visited the year before, this Bosnian restaurant is always busy, so definitely book ahead if you can. We chose to show up without booking, and had to join a queue of other expectant diners. In the end they squeezed us in on the cobbles outside with blankets to stay warm, and we were treated to truly delicious food. If, like me, you find the options on the menu slightly alien, definitely ask the server for their recommendations – you won’t be disappointed. The Rajski Vrt, or Garden of Eden, sits in the middle of Lokrum island in the ruins of a monastery. The entire restaurant is outside on a veranda overlooking the gardens, with the sea in the distance, and peacocks pecking around your feet. 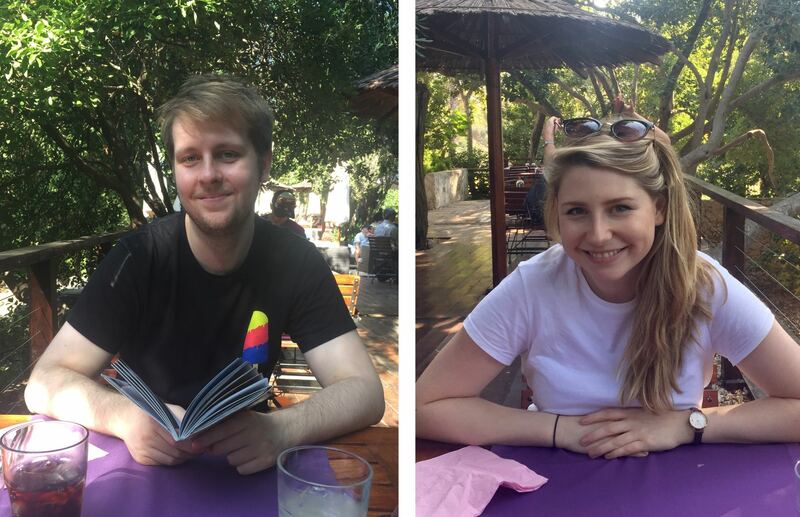 The food was great, and we thoroughly enjoyed sitting in the open, the sunlight coming down through the trees. The perfect lunch location! 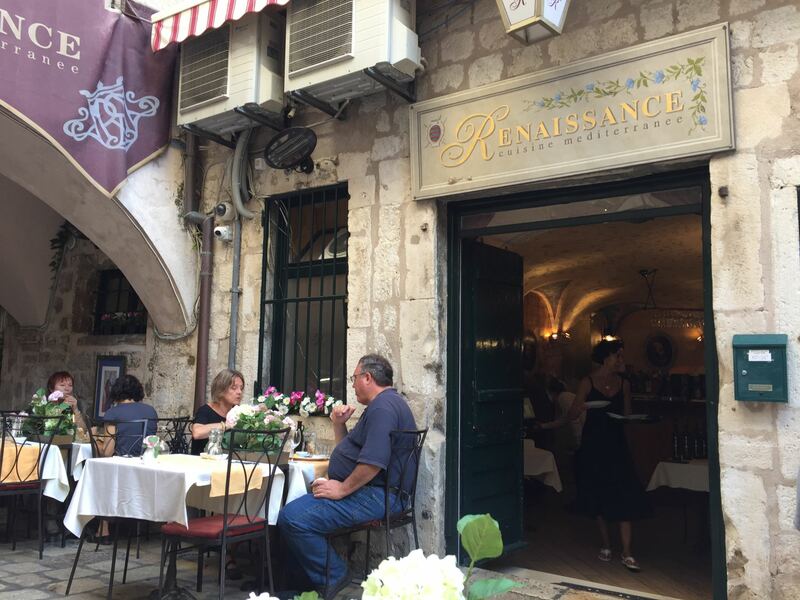 We were enticed into Art Restaurant Renaissance by a salesman with a leaflet, who told us it was a museum with food. 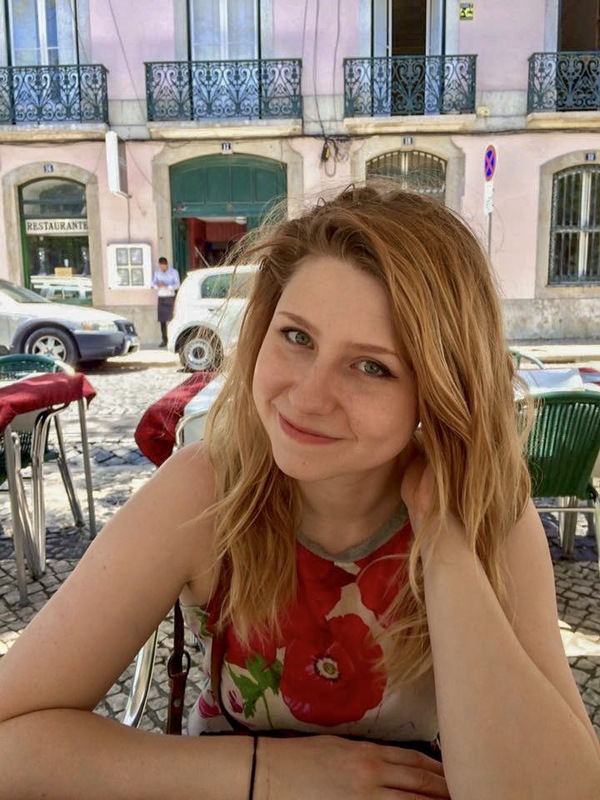 Whilst this was not precisely the case, the restaurant itself was nestled underneath an archway in one of the Old Town side streets, with paintings hung on the walls – quite an unusual sight! The food was cheap and cheerful, which actually was just what we needed, and we took advantage of a wine tasting menu that included samples of 4 different local wines. The waitress even took the time to talk through each one and explain the tasting notes and where it was from. The main street in Old Town is packed with bars. Yes, they’re tourist traps, and the prices are a tad high because of this, but a few of them also do cracking cocktails which makes for a great way to start the night. 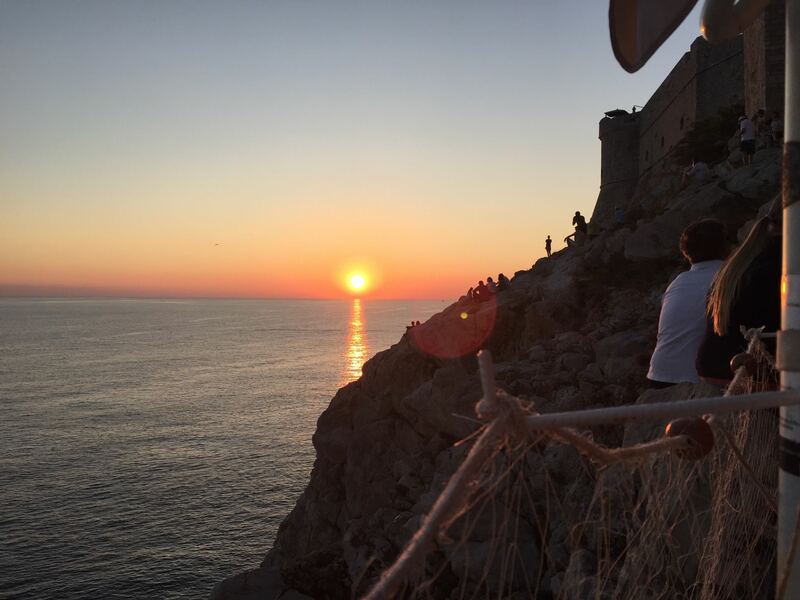 Our absolute favourite was Buza Bar on the cliffs outside the town walls. Possibly one to miss if you have a fear of heights – it’s made of several rows of chairs along different levels of rock, all facing out to sea. The “secret” passage to Buza Bar on the cliffs outside the town walls. The bar itself isn’t much to look at, there’s no plumbing so you can’t order tap water (and whatever you do, do not use the toilet), but that doesn’t really matter as the real point of this place is the panoramic view. 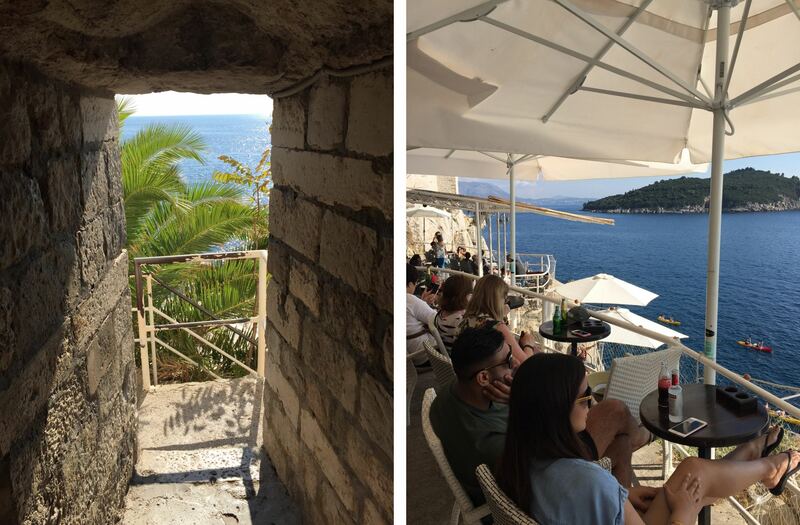 Take a seat, order an Ožujsko beer, a soda or a single serving bottle of wine, and gaze out towards Lokrum island, watch the ships sailing past and, if you time it right, admire a truly spectacular sunset. View of the sunset from prime seats at Buza Bar. There’s a shuttle bus from the airport that goes right to the front gate of Old Town in about 30 minutes, costing 40kn for one way or 70kn return. 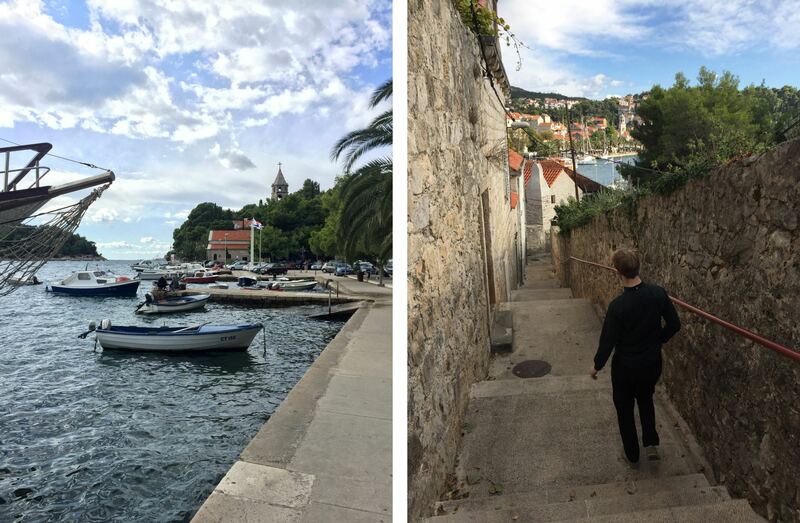 Depending on where you’re staying you can pretty much walk everywhere within Dubrovnik. 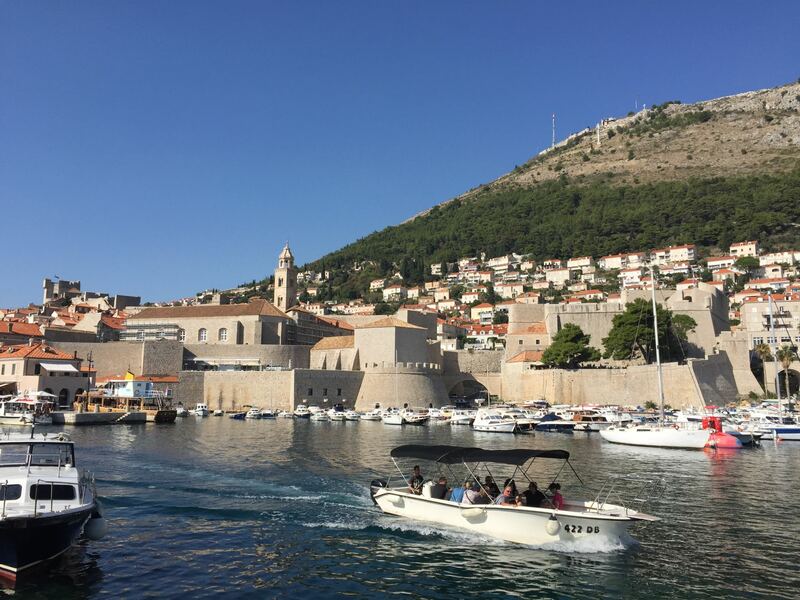 When it comes to exploring the surrounding area, there are many boats to local towns or islands from Old Port in the Old Town or Gruz Port on the other side of Dubrovnik. We booked our boat tickets to Cavtat in advance to get a discount, but then on the day we planned to go there was a storm and all the boats beyond Lokrum were cancelled. We couldn’t get a refund as it was our last day, and had to pay to get a bus there instead (that was a stressful day). Ferries leave the Old Port for islands around Dubrovnik. 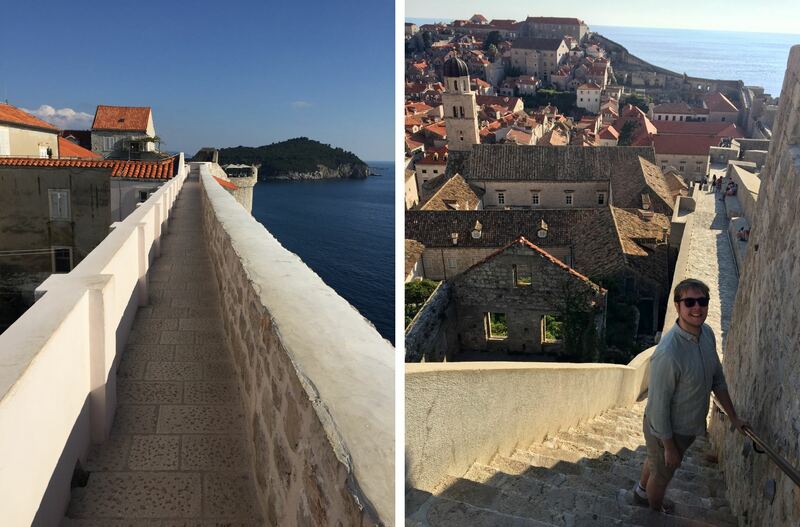 Our trip was in October, and the hot Croatian sun made it very warm during the day – shorts or dresses were ideal. If you’ve got freckly English skin like mine you’ll need to keep yourself topped up with sun cream. By contrast, the breeze from the sea means that the temperature drops quite a bit at night. I wore jeans and long sleeved tops most nights and had to wear tights with my dress when we went to the Taj Mahal restaurant. This is Mishka. She’s the cat that came with our airbnb and she was a marvellous hostess. I’m horrifically allergic to cats and even I fell in love with her. I’m pretty sure Matt misses her every day. The food is perhaps not as good in Croatia as, say, Spain or Italy or France (you might disagree with me here), but the people are lovely, the Old Town is just gorgeous, and the cats are top notch.